Buca di Beppo serves authentic Italian cuisine in an eclectic, vintage setting. At Buca you’ll enjoy the Italian traditions of food, wine and hospitality. Our food is meant to be shared and served on family-style platters perfect for passing around the table. With over 90 locations nationwide, Buca is the perfect place for celebrating a special occasion, planning a business dinner or having a night out with family and friends. 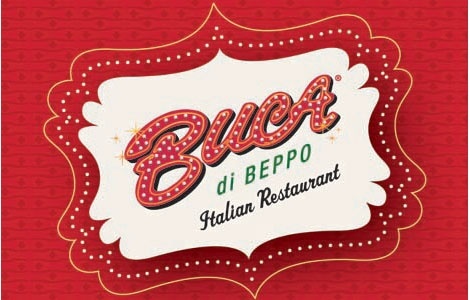 National Gift Card is the best place for you to order Buca di Beppo gift cards in bulk. We are the experts in all things gift cards and can set up your gift card solutions program for you today. Please contact us for more information on bulk, direct-to-recipient, or individual gift card fulfillment for your gift card program. Contact us here or call us at 888-472-8747 today! BUCA, Inc. is the parent company and owner of Buca di Beppo restaurants. BUCA, Inc. is not affiliated with NGC. BUCA, Inc. is not a sponsor or co-sponsor of this program. Use of our restaurant names, logos or trademarks requires written approval from BUCA, Inc. See backside of gift card for additional terms and conditions. For balance information and to find a location near you please visit www.bucadibeppo.com or call 1-866-EAT-BUCA (1-866-328-2822).